Cashmere Authentico stands for high-quality cashmere, traceable all the way from the Mongolian wild steppe to the Schneider Group dehairing plant in Ulaanbaatar delivered to customers’ textile manufacturing facilities. During the busy textile month of September 2018, The Schneider Group launched its new integrity scheme Cashmere Authentico. Cashmere Authentico is cashmere fibres sourced from a limited number of nomad families in Mongolia. These families only graze a small flock of cashmere goats in a region of the Mongolian steppe with healthy and intact grasslands. A team of cashmere experts from the Schneider Group buys the cashmere directly from the families through pre-selection of the material. From there the fibre gets transported directly to The Schneider Group dehairing plant Monital in Ulaanbaatar. Once the cashmere arrives at the plant, the fibre gets sorted by colour, quality and fineness. Afterwards, the precious fibres are washed, dehaired and tested for export. All along the supply chain the cashmere is tracked and can therefore always be traced back to its origin. With the local Monital team of cashmere experts in Ulaanbaatar, the company was able to build up relationships with different nomad families to source high-quality cashmere directly for the Authentico program. For cashmere to become part of the Authentico scheme, it needs to fulfil a set of requirements. These include that the fibre has been grown in areas of the Mongolian steppe which are not at risk of desertification. In addition, the nomad families need to ensure high animal welfare practices. The Schneider Group will only work with the families directly to ensure transparency. This also allows the company to pay premium prices to each grower family to ensure a sustainable livelihood. In addition, processing of the cashmere needs to comply with high standards. The Monital plant in Ulaanbaatar adheres to the highest industry standards of the European Union. This includes state of the art water treatment facilities and a continuous reduction of energy consumption. These requirements in return mean that Cashmere Authentico will only be available in small quantities as each family only supplies between 20-50 kg of cashmere fibre. Textile manufacturers interested in sourcing Cashmere Authentico for their products, can join the program and start becoming part of this very special relationship. 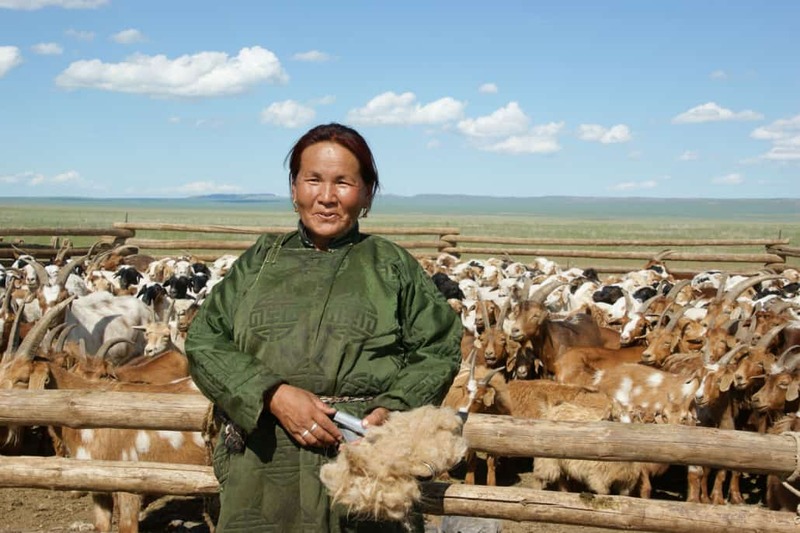 A relationship connecting the cashmere growers of the Mongolian steppe with consumers of premium cashmere textiles.